and started writing my views as a comment but it went on to be so long that I decided to publish it as a blog post instead. I think Google is synonymous to search and FB is synonymous to social media but with the integration of social signals and search Google realizes the need to have access to some reliable social data that they can trust and also integrate easily in their search algorithms. Google had access to Twitter data from October 2009 onwards and Google had announced the Real Time Search option but now in June 2011 that option has been deactivated as their deal with Twitter has expired. And at the very same time Google announced Google+ because they want to continue with their integrated results of search and social. Google is very much focused on search and according to me the Google+ initiative is mainly aimed at enhancing the quality of search results which is very much affected due to the mal practices because of link building and content spamming. Google clearly has mentioned that ,”Our vision is to have google.com/realtime include Google+ information along with other realtime data from a variety of sources.” So if businesses want to be found on the real time search of Google having a presence on Google+ is a logical thing to do. But that does not mean that they need not have a presence on FB as more than making a choice of being on FB or G+ it is more about how I can widen my out reach further by reaching out to my niche targeted audience via search and social media. FB originated with a vision and mission of social out reach and connections Google started off with a focus on search which now is referred to as library search as social media has given birth to real time search so for Google it seems the most logical next step to take. But as social media and SEO companies our objective is to help businesses have a maximum out reach on the web i.e on the search engines and also on sites where the netizens are spending more and more time. Eventually as the most important aspect is the target audience, depending on your product, service or purpose of online promotion one will have to select the platform and as the title of the post says it is much beyond the initial hoopla, its true only time will tell whether Google is able to succeed in its third time initiative of social media after Orkut and Wave. So far it seems very promising as the Circles aspect of G+ does give you an easy choice to make regarding what you want to share with whom. Moreover, Google is also experimenting with business profiles on Google+ which they might integrate further with Google Places which is another inviting feature for businesses to have a presence of Google+. When Google had its humble beginning as a search engine nobody had thought that they would out do Yahoo or Altavista but due to their technical expertise and focus they have been able to achieve a monopoly for search. Only the future will say whether FB will be able to forge ahead as it is being doing for all this time as now they have true competition else there is full possibility that they can meet the same fate as Yahoo if their focus gets shifted. 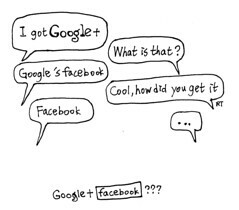 Otherwise I think FB and Google+ can both exist together serving different purposes and niche targeted audiences.